I just finished my second full week at the firm and I was lucky enough to get in on working the Sunset Junction Street Fair. It started off 30 years ago as a block party and now has become a Los Angeles staple in the music scene. 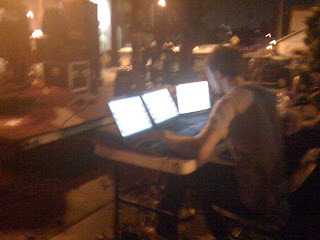 While we worked long hours in the heat, dealing with crazy band members, pompous managers and plenty of people trying to finagle their way in (we were working the press booth, a.k.a. the place where everyone wanted to be -- we gave away the coveted wrist-bands), it was so much fun. In addition to free food and beverages, we got all-access to all five stages and the VIP area. I had so many wrist bands on that it looked like a tattoo sleeve: a pass for all-access, one for VIP, one for a particular stage, one for backstage, one to signify we were the media, one to show that we were going to be there all weekend, etc. It's pretty funny working these types of things because once someone catches wind that you (somewhat) make decisions, they get stars in their eyes and want to be your best friend. I couldn't walk anywhere without someone catching wind of all my wrist bands (obviously, how could you not see them?) and wanting me to "do a favor." PR is great because you can do a lot of favors, however, there comes a point where you have to determine what is most cost effective for your client. Unfortunately, we had to put our foot down with a lot of people who were really cool, and with a lot of people who thought they were awesome but really needed to get a grip on life and realize they weren't. 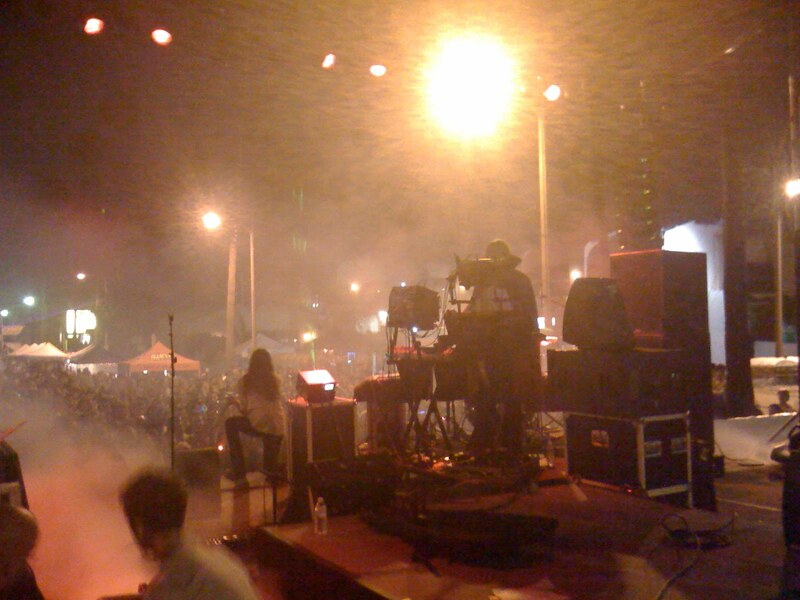 Friday Night I was able to enjoy the Ghostland Observatory performance. They were amazing. If you haven't seen them live, you should! They not only have great music but they do a laser light show while they perform. The best part? 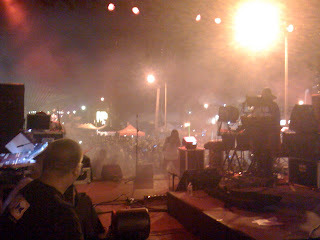 I got to be onstage during the whole thing! The last time I was on stage was during an *NSYNC concert in 1999. Yes, I'm that awesome. Sunday's highlight? Well, first off, it went by so much more quickly than Saturday, so that was a bonus. Second, I had two celebrity run-ins that I was probably way too giddy about. Kelly is stunningly gorgeous in person and she has an impeccable sense of style. When she walked up to the booth, she was with her friend and I don't even remember what was said -- I just dove for the "VIP/ALL ACCESS/YOU CAN HAVE WHATEVER YOU WANT" passes and handed them over. She was totally polite and even asked my co-worker who her glasses were by. Lots of love for Kelly! Is it bad that I kind of wanted her to use the f-word? I am a huge Degrassi fan. I mean, it's pretty much the best show ever. So today when Shenae Grimes came up to check-in frantically trying to find a way to get tickets, I had no qualms giving her the same passes I gave Kelly. She was actually just looking for a place to purchase tickets but was running late to catch her friend's performance. A complete geek-out moment: I told her that I really liked her and not to worry, that the wristbands were all access and she would be fine. She asked for my name and thanked me so many times that I lost track! I even got to meet her parents who came with her. She was totally adorable -- she had brought her own vintage camera to document the occasion. I had a great time working the fair and can't wait for more events to participate in! One of our clients is The Grammy Awards, so I'm praying I get an "in" with whomever sees over that account. Happy Sunday!